I can't deny some of these points, but I do think you can get a better day. If at all possible, try to go on a weekday in May, late August, or late September. And sorry about the rude staff. Hopefully next time is a better experience for you! See, going to any park to get creds should be easy enough right, especially if you have 2 days to do it. Not so with my experience, took me 3 days to get them all, and whilst Viper, Goliath and Batman were good fun (not to mention the fab Terror Twister 2), the rest of the creds are quite crap. The food was pretty awful, operations on most things were slow and ponderous, it's mainly just concrete everywhere and the volume of people was just insane. I went back with @Howie and the crowds weren't as bad but it just wasn't a good place to be. SF are very much like Thorpe, plenty of middle tier creds and crowded, with loads of Fast Lane passes being used but unlike Thorpe they generally have a world class attraction(alas SFstl does not), and the Justice League rides are great. I didn't have an awful time with the clientele at SF parks generally, Hershey was worse for that for some reason. Thorpe has slightly better food imo, I haven't had any good food at a SF park as yet. It's interesting that they already appear to have both trains (yellow and blue) complete when they're likely still pushing dirt around on site. EDIT: Actually, it looks like the trains are the same trains that were shipped to Sun Tsu Cultural Park, according to some RCDB photos...That's definitely part of the launch track for Maxx Force though. EDIT 2: Ok, these aren't the trains that went to Sun Tsu Cultural Park - there are some subtle differences...nerf bars are different colors and the fascias on the Sun Tsu coaster show a tutone paint scheme whereas this photo shows a solid color scheme. Either Six Flags jazzed up their rendering to showcase an inaccurate train, one of the China launchers is receiving new trains, these belong to Steel Curtain, or there's another S&S launcher that we don't know about yet. Pear, EpochEmu, Matt N and 3 others like this. Could the trains not be for the air launch coaster going to Window of the World? The renders show a 2 person wide train, not 4. My guy, that's why I edited the post twice. You should read the whole thing before trying to correct me. Firstly, I wasn't correcting you. If I was correcting you, I would have quoted your post. I just added to the conversation, since it was something that you didn't look at. And yes, I am aware that renderings arn't always 100% accurate, but you can clearly see that MAXX Force has specifically designed trains for it. There is no reason they would render a 2 person wide train when S&S already provide a 4 wide train. It's not like the wider trains are suddenly new technology available, S&S have had them for a number of years. I can confirm that those trains are not for Maxx Force, but I don't know exactly where they're going. DelPiero, Snoo, tomahawk and 1 other person like this. This puppy isn't going vertical anytime soon. Pear, GuyWithAStick, Pokemaniac and 1 other person like this. Antinos, tomahawk and GuyWithAStick like this. Antinos, Matt N, Snoo and 1 other person like this. 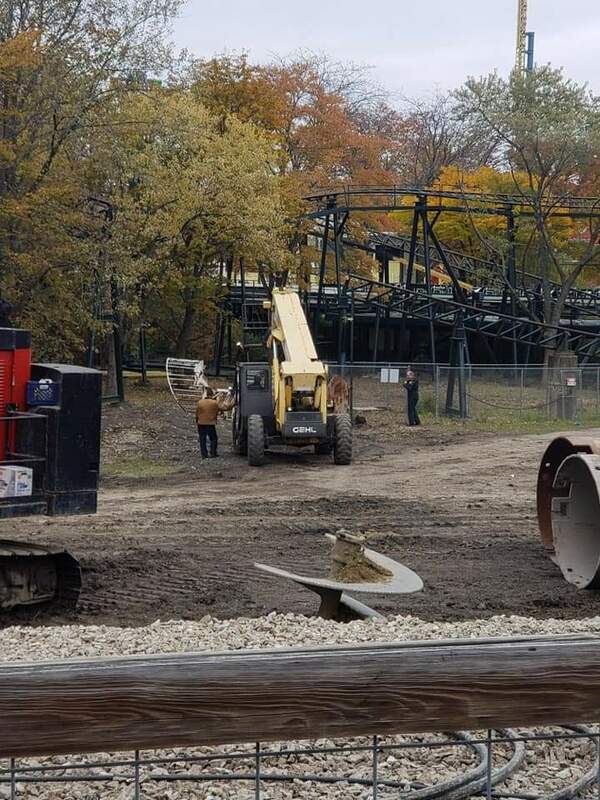 Track/supports/air tanks are on site! I was there today, and noticed that there was a ton of work going on. A lot of footers have been poured, and a lot of the major groundwork has taken place. I'd expect this to go vertical in the coming weeks. vaugc002, Coaster Hipster, EpochEmu and 5 others like this. I always wondered what was inside the launch track. How does that actually work, it just looks like a big empty space under where the catch car rolls. iac17, Coaster Hipster, Pear and 2 others like this. Nah, I think they will use a similar design to Ring Racer. Steel Curtain is a completely new type of coaster, so it required new custom designed trains. Anyway, they already showcased the trains in the animation. It's nice that you'd think that but the fact that they're making another giant coaster with brand spanking new trains with enormous similarities besides the launch.. creating or reusing old trains simply because of that is.. I dunno.. the word.. it's in my head..
Also.. the animation is not final word. Ever. Just anywhere. Ever. So let's take that grain of salt and throw it out the window until we have proof. Best proof? The same ride designer with new trains a couple of hundred miles up the road on a similar design. Good to see this stuff finally showing up on site. I suspect the train design won't be too far off from what was shown in the animation.